While we’re at sea for extended periods, the vast majority of our supplies, parts and mail get transferred to us from other ships. Sometimes helicopters lift the cargo from flight deck to flight deck and other times it’s delivered on a highline connecting our ship with another. 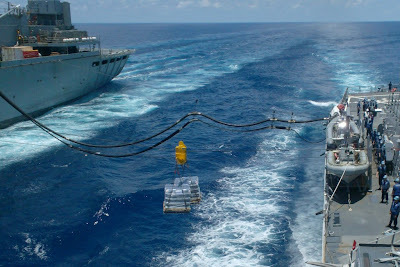 Both ways of re-supplying are categorized as “underway replenishment”, or UNREP, with transfer by helicopter known as “vertical replenishment”, or VERTREP, and transfer by highline known as “connected replenishment”, or CONREP. 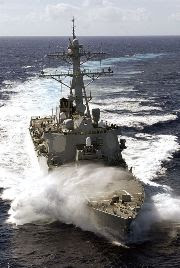 CONREPs are further broken down into “fueling-at-sea”, or FAS, and “replenishment-at-sea”, or RAS. 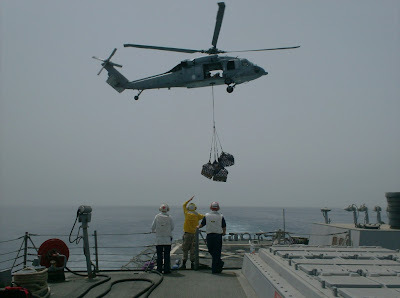 Both methods of transfer require extra maneuvering watches and crews to run either the flight deck or the replenishment rigs, and any time parts, mail or stores are delivered, all hands turn to and help strike the materials below. And, for a ship the size of RUSSELL, that means officers and chief petty officers, too. A delivery ship transfers cargo by highline and pumps fuel simultaneously. VERTREPs present the greatest challenge in stowing materials. For safety reasons, only a portion of the flight deck may be used to receive loads, so once the helicopter clears the deck, the crew has just a few minutes to get the pallets out of the cargo nets, repositioned and broken down, and the flight deck readied to receive another load. Crew members break down a pallet of stores. Meanwhile, the whole crew stands ready in a line inside the skin of the ship to pass the boxes and bags hand-to hand from the flight deck to their destination. 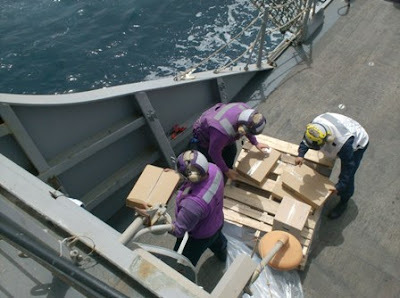 A proficient crew will break down and stow materials at the rate of a pallet a minute for 30 to 45 minutes to complete an average replenishment. This site provides some great info regarding things we at home take for granted, such as just receiving mail and supplies. Thank you for the time and effort!!!! Cat, VERTREPs may look chaotic, but once you get rolling there's a rhythm to them that's almost like a ballroom dance. It's especially cool doing it on a big ship, working two helos simultaneously. At least, it's cool until the XO comes down to the flight deck and starts ripping into people for not being squared away. Not that any XO would actually do that. Right, Commander? Great site! Keep it coming. From what I remember, the bridge team definitely has to be on their collective toes during CONREPS. Do your OOD's/Conning officers change out frequently to mitigate the stress of being alongside that long? Ever have to do a CONREP w/ the CVN? Tell the crew thanks for all that they do. Unseen and generally undiscussed about how these evolutions go so well: One other thing that happens during maneuvering evolutions with ship's in dangerous situations is extra eyes and minds being put on station. A Helm Safety Officer is stationed behind the helmsman to validate the orders from the "conn" (that being the person who is the one and only one who can give rudder/engine orders at any given moment - usually the Junior Officer of the Deck) are understood and properly performed by the helmsnman. Is it a lack of trust? No...it's a lesson hard learned at sea, that things get busy and sometimes confusing, so the extra person, can be a life saver by being able to quickly clarify an engine or rudder command, but most often seems like the waste of a person. Also, down in After Steering, electricians and enginemen (the two ratings that maintain the equipment), and an after steering safety officer man up for the time the ship will be in "restricted maneuvering" conditions such as this. If control from the helm equipment from the bridge is lost, this crew will take over sterring immediatley. During normal operations, After Steering isn't manned, and only checked on by the Sounding and Security watches each hour. Those are but two extra measures, but certainly not all, that are taken to ensure the equipment of the taxpayer, and the lives that they carry are kept as safe as possible while at sea. And, Cat, like Ken says, it's a ballet out there and with two helos hauling loads in a racetrack, you can move some serious cargo volume...only limited by how fast the sailors can keep staging it on one deck and strike it down on the other. It's an all hands operation that relies on the weakest link to be fast! When it's going well, the sight of the "small boy" is like a busy ant hill that just got kicked from the prespective of the "CLF" (Combat Logisitics Force) ship's crew. Got to love "your" blog! Im in the portuguese army, still, i've been working with navy guys from all around the world (us included), this is definitely "the" inside info on the daily routine aboard a war vessel, the one that usual is kept within the people who serve in it! congrats and keep up the good work! These are all the things my son probably excitedly tells his wife and figures would bore or confuse me after his 15 years of service. I even take notes when we talk on the phone so I can keep all the phrases straight! I feel a much stronger connection now and will continue to monitor your blog. Thanks to all of you for sharing and know that my prayers are with you all.